One could say that a well-made documentary provides viewers with "the next best thing to being there." While the cyber age allows us to operate more globally from the comfort of our computers, it can never replace the value (and pleasure) of traveling to view work and meet filmmakers, distributors, festival directors and programmers from other regions. This past summer, I traveled to Prague, Czech Republic, and St. Petersburg, Russia, through the support of a grant from CEC (Citizen Exchange Council) ArtsLink, which encourages and supports the exchange of artists and cultural managers between the United States and Central Europe, Russia and Eurasia. (www.cecartslink.org). For my proposal, I came up with a short list of international documentary nodes that I could visit early enough in the summer so that the trip could impact what we might show at the Margaret Mead Film & Video Festival (www.amnh.org/mead), which runs November 3-6 and 12-13 at the American Museum of Natural History in New York. I also offered to bring some samples of work from our most recent festival, and I made presentations at both venues. After arriving in Prague and getting situated for a day, I headed off to Nymburk, a small town 50 kilometers away by train, to attend the second workshop of Ex Oriente Film, a year-long training workshop for Eastern and Central European documentary filmmakers, organized by the Institute of Documentary Film (IDF). IDF is a nonprofit training, promotion and networking center based in Prague that is focused on the support of East European documentary film and its wider promotion. The workshop includes three intensive sessions and e-mail consultancy under the leadership of experienced tutors, made up of European independent producers, TV commissioning editors, distributors, film directors and more. These tutors help the workshop participants develop their projects and find financing and foreign partners, advising them on further steps to take toward realizing their films. Besides practical content and individual tutoring, the workshops include lectures on the basics of the European audiovisual market (legal and economic aspects) and how independent production companies work in Europe. The workshop is organized in cooperation with the European Documentary Network (EDN; www.edn.dk), an international association for documentary professionals. While sequestered in Nymburk, I had the opportunity to meet the workshop participants and sit in on the sessions. Thirteen projects were represented, with quite a range of subject matters and styles. Four projects each came from the Czech Republic and Poland, two from Hungary and one each from Germany, Latvia and Slovakia. The tutors and outside guests came from across Europe and Scandinavia. Besides individual break-out groups, there were presentations intended for the whole group. The first afternoon offered a group screening and case study of Children of the Decree, the story of the Romanian baby-boom generation willed into being by dictator Nicolae Ceausescu when he issued a decree forbidding abortion. Following the film, Tue Steen Muller, the workshop leader and former director of EDN, conducted a conversation with Romanian filmmaker Florin Iepan, presenting the story of the making of the film. In many Eastern European countries, there is little or no systematic support of independent documentary film. The resources offered through the grant system are limited and the only ones willing to buy documentaries are the state-run or public television monopolies, which lack money. IDF wants to change this situation, in particular by educating and supporting small independent producers who are able to generate funds for their own films from various European resources, make their films and distribute them. There seem to be many more avenues for documentary makers in Europe--and a real community of support. Ample opportunities for co-productions exist as well, with many television stations that actually have funds and slots earmarked for independent documentaries. But what struck me most was the extended European regional support system, where something like IDF's workshop is offered with this kind of cross-European engagement. The kindred spirit of independents in America seems much more isolated--somehow connected to that romantic American notion of the independent maker going it alone. While preparing my presentation for the workshop, I was told that in Europe, the common perception of American documentaries is defined by titles such as Fahrenheit 911, Super Size Me or The Yes Men. IDF wanted to see examples of other trends "behind the marketing curtain." I showed excerpts from some titles that are part of our traveling festival. Another film that was screened was The 3 Rooms of Melancholia (Pirjo Honkasalo, dir. ; Kristiana Pervil, prod. 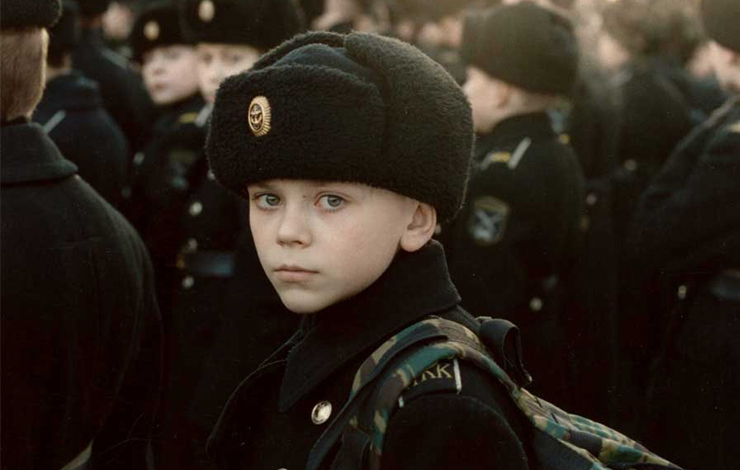 ), the award-winning film that examines effects of the war in Chechnya and the damage inflicted on the country's youth. There was also a makeshift videotheque set up in a game room in the hotel, so I was able to screen some of the already completed films by many of the workshop participants. After four days at the workshop, I headed back to Prague, where I met with Dr. Michal Bregant, the dean of the Film and TV School at the Academy of Performing Arts (FAMU, in translation; www.famu.cz). FAMU and IDF have a strong connection, with most of the organizers of IDF having come out of FAMU's film program. After the inspiring week in the Czech Republic, I flew to St. Petersburg to attend the Message to Man Film Festival. Now in its 15th year, the festival was originally established as the International Non-Feature Film Festival by the State Committee of Cinematography of the USSR, Filmmakers' Union of USSR, State Television and Radio Committee of USSR and the Executive Committee of the Leningrad City Council. The festival includes an International Competition, an International Debut Competition and a National Competition of Documentary Films of Russia and Special Programmes. According to festival programmers, the most important criteria for selection are how filmmakers express themselves, what methods they use and how they "correlate with their characters." My main interest here was to see Russian documentaries, along with other international titles, but I discovered, much to my disappointment, that while all international films were either subtitled or included simultaneous translation via headsets, the Russian documentaries, except for those in the international competitions, were only in Russian. A couple of other international colleagues were also frustrated by this, and through the assistance of award-winning filmmaker Viktor Kossakovsky (who is based in St. Petersburg and was on the Message to Man jury), we were able to visit the St. Petersburg Documentary Film Studios (www.cinedoc.nv.ru). There, we met with Tiatcheslav Telnov, the general director, who later provided me with DVDs and tapes of documentaries, with subtitles. Back at Message to Man headquarters, I was assisted with translating our call for entries into Russian, so that a flyer could be distributed and posted during the festival. After my time in Prague and St. Petersburg, I returned to the States with over two dozen titles. As in Prague, the festival organizers offered me a slot to make a presentation about the Margaret Mead Film & Video Festival, and I showed excerpts from Aaron Matthews' A Panther in Africa and Coco Fusco's aka Mrs. George Gilbert, both of which I thought might have particular resonance with a Russian sense of history and politics. I flew home after two weeks abroad with my head exploding with new insights and discoveries. I had seen such a range of work and met such an interesting group of filmmakers, programmers and festival directors. What's more, after I returned to New York, ArtsLink received an Open World grant to bring three filmmakers and one representative from Message to Man to the US this fall, and our festival will host them and screen their work. Kathy Brew is co-director of the Margaret Mead Film & Video Festival and an independent documentary filmmaker based in New York. With her partner, Roberto Guerra, she is completing a documentary portrait, Being Bronze: A Portrait of J. Seward Johnson (working title).